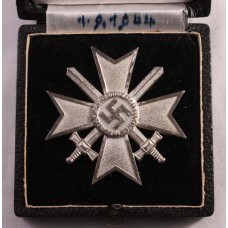 De1168.Knight Cross 1939 with Ribbon in Etui of Issue. 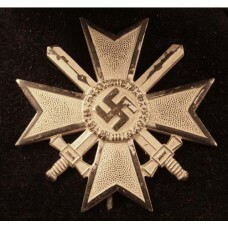 Maker marked with "935-4" for maker "Steinhau..
De1243.Iron Cross Second Class with Ribbon, maker marked on the Ring with "100" for maker "Wachtler ..
DE414.War Merit Cross with Swords First Class in Case of Issue. 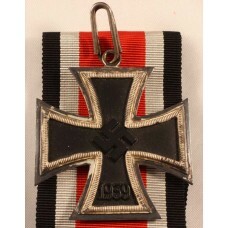 Cross in Nickel-Silver, maker marked..
De368.War Merit Cross with Swords Second Class in paper Pouch. Envelop marked with makers name "Ph.T..
De401.War Merit Cross with Swords First Class in Case of Issue. 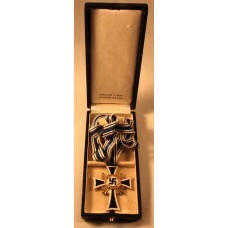 Maker marked "62".Nice Nickel-Silver..
De1230.Spanisch Cross with Swords in Silver. Unmarked. 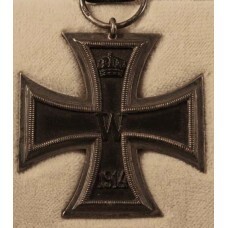 Cross made in Nickel-Silver.Very nice Silver ..
De504. 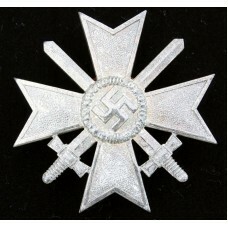 War Merit Cross First Class with Swords in Case of Issue. Maker marked with "1"..